Filming at the the Samuel Beckett Bridge. 24/8/2014 Picture by Fergal Phillips. 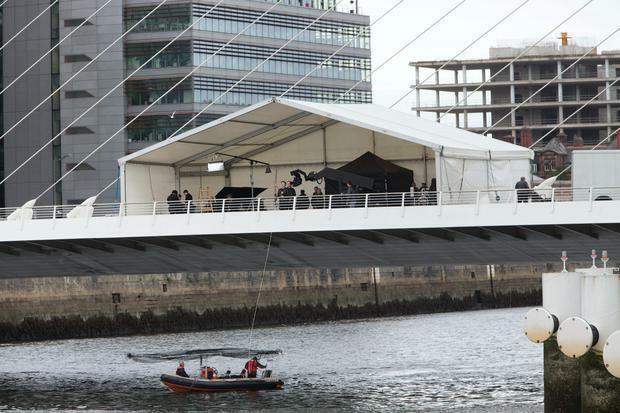 THERE was more travel chaos in Dublin today as the Samuel Beckett bridge was closed with U2 understood to be filming a new single. On the day of the Irish Rail strike, security sources confirmed that the bridge will be closed until midnight tonight. It is understood that a music video is being filmed there. U2 have previously filmed music videos for Beautiful Day on the roof of the Clarence hotel and Sweetest Thing on Fitzwilliam Square. "There has been talk of them going back to their roots and filming something in the capital for the new album as they love to use Dublin as a backdrop for their music," a music insider said.In what has been the longest gap between new releases, the stars were spotted filming in the famous Riviera studio in the south of France. While they were in Nice, a ring of steel was erected around the entire area to ensure no leaked footage emerged, with dozens of trucks seen bringing equipment into the studio. The band's last release was in 2009, No Line on the Horizon, which didn't perform as well as expected. It's understood they had delayed the new album, which will be their 13th studio collection, so they would have more time to work with Adele's producer, Paul Epworth. The band has also recorded with producers Danger Mouse, Will.i.am, David Guetta, RedOne, Epworth and Ryan Tedder.